Universal Studios Classic Monster Collection, eight DVD set released October, 2000 by Universal Studios. Includes Dracula, the Spanish version of Dracula, Frankenstein, The Mummy, The Invisible Man, The Bride of Frankenstein, The Wolf Man, The Phantom of the Opera, Creature From the Black Lagoon. Mono sound, full screen, unrated. Extras include critical commentaries, documentaries, theatrical trailers, etc. Manufacturers suggested retail price, $199.98. In the first part of this review, dealing with Dracula in both English and Spanish language versions, there was some relatively new ground to cover, since the Spanish version was seldom seen until the advent of home video. In this segment, its tough to think of something new to say about Frankenstein, Bride of Frankenstein and The Invisible Man, among the most closely examined of all horror films, but Ill give it a shot. The importance of these movies to horror film historians is beyond question; their entertainment value is debatable only by the unschooled. The three movies are the essential horror-tragedy, horror-comedy and horror-satire of the classic era. If youre a horror fan, or a generalist film fan, you really ought to watch them, in whatever form you can find; if youre a collector, youll want the Universal DVDs. Theres something curious about the fact that three of James Whales horror films are included in Universal Studios Classic Monsters DVD set, while the fourth, The Old Dark House, is absent. Perhaps its because there are no marketable monsters in that weird 1932 comedyodd characters, but not a mummy or vampire in sight. (There is a fine version issued on vhs and DVD by Kino Video and Image Entertainment, however.) The story goes that it was considered a “lost” film until Universal found a print in its own vaults, which is analogous to finding “lost” money in your wallet. But then this is typical of the treatment of Whales films by the Universal folks, driven by the same business motives that drive most of the folks who decide which movies are rescued, restored, or mutilated. In Whales case, recall that this is the movie studio that has not only copyrighted Jack Pierces monster makeup, seeing it reproduced on everything from T-shirts to valentines, but also has gone so far as to trademark the names of the principle actors in its old horror films. Personally, when I see “Boris Karloff”and even “Elsa Lanchester” it makes me wonder: just how much commodification can art withstand? Will “James Whale” be next? How ironic that would be; set aside ambition, youre now a trademark, merely the next best thing to a logo, the ultimate typecasting. Whales identification as “that Frankenstein director” plagued him in his lifetime, and now it apparently contributes to the suppression of most of his films, some of which are apparently lost forever. Even after the success of Gods and Monsters (1998), a biopic in which the Whale character decried the neglect of his oeuvre, the only non-horror Whale film currently available from the studios home video division is Show Boat (1936), one of his favorites and a fine musical. Recently I was lucky to find a beat-up old VHS copy of Whales The Man in the Iron Mask (1939), a talky swashbuckler which comes alive in some creepy sequences involving the mask, and still shows up the lameness of recent remakes. I paid six bucks for it, lucky meId have to pay considerably more to unauthorized sources for some of Whales other films. But since were not likely to see Remember Last Night? (1935) or One More River (1934) on high-falutin special editions any time soon, lets be grateful for what we have, and enjoy the undeniably nice job Universal has done with Whales masterpieces. If youre not already hip to DVD, there are a couple of reasons to own movies in this format. Unlike videotapes, you can watch them repeatedly without damage, as long as you handle them carefully, and DVD provides much better sound and picture every time. In the case of films that are 60-plus years old, the improved picture quality can show up flaws in the material youve never noticed before. Of the three DVDs at hand, The Invisible Man seems to have suffered the most from age. The material used for the transfer is in need of restoration, to get rid of scratches and scars, and the sharpness of the picture makes the special effects look cheesy at times. Despite flaws, picture quality is laudable on all three films. The reproduction of the original mono sound is equally good, and you really feel the power of Claude Rainss voice in Invisible Man and hear the details of Franz Waxmans innovative score for Bride. Some of the best-loved films of the classic era are the most abused and endangered, because the studios have used the same archival materials repeatedly to create new prints for re-releases. These three films look pretty fresh, compared to many others of their era. Each DVD contains a “making of” documentary, photo and publicity materials and other text information, and an optional audio track of commentary by a film historian. Rudy Behlmer does the talking on Frankenstein and Invisible Man, Scott MacQueen on Bride. From these supplements you can get a good briefing on the background of these films, though a good portion of the information from the documentaries is repeated on the commentaries, and there are redundancies from disk to disk. These disks also represent a praiseworthy effort to replace material deleted by censors and other meddlers. 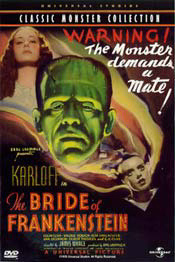 One key restored piece is the well-known sequence in which Frankensteins creature lobs a little girl (Marilyn Harris) into the lake (the commentators blame the original deletion on censors, though one source of mine claims it was the choice of Karloff, who would have preferred that his monster drown the child more gently). Also restored is Henry Frankensteins line, “In the name of God, now I know how it feels to be God.” I believe these bits were put back some years ago, however, when Universal issued a “restored version” videotape. In general, these DVDs take full advantage of the medium to put the films in historical context. Those fans without extensive reference libraries should applaud this inclusive decision by Universal, and newcomers to classic era horror should come away with a better appreciation of the movies. When it comes down to it, a movie is nothing but sound recording, photography and editing, and without photography, it would be radio. So it always bothers me when the contributions of the cinematographer are overlooked. Perhaps critics arent aware of the division of labor on any particular set, so they assume, dazzled by the auteur theory as they are, that the director does it all. James Whale was by all accounts an auteur on the set of his horror films, worrying over details of makeup, costume, sets, lighting, staging, camera placement. But when a film is a success, chances are the director of photography played some role in that success. Horror fans should notice that the great Arthur Edeson is credited as DP on three of Whales horrorsFrankenstein, The Old Dark House and The Invisible Man, and on a couple of Whales non-horror films. It seems to me Edeson must have contributed something to the craggy gothic look you see in Frankenstein, a precedent followed nicely by Whale and DP John J. Mescall in the photography for Bride. In fact you see a little of that style in All Quiet on the Western Front (1930), for which Edeson won a cinematography Oscar, and in some of his later noir and adventure films. Since Edeson barely gets a couple of mentions in the documentaries and commentaries in the Universal DVDs, I feel the need to fill the gap. Edesons career began around the dawn of narrative feature films, with A Gentleman from Mississippi (1914). He shot two of the best fantasy silents, The Thief of Baghdad (1924) and The Lost World (1925), a couple of silent pseudo-horrors, The Bat (1926) and The Gorilla (1927), and a full share of “mainstream” films. This was a hardworking guyFrankenstein was one of five films released in 1931 on which Edeson worked as DP. He was just as busy for the next couple of years, when he was the DP of choice for Whale. In the 1940s Edeson brought this experience to crime dramas, with dramatic results. Film noir, a genre that takes its name from a distinctive visual style, owes plenty to Edeson. Critics say the first clear example of noir style was in The Maltese Falcon (1941), but usually the credit goes vaguely to first-time director John Huston rather than Edeson, the films veteran cinematographer. If you study it a bit, it certainly looks as though the harsh shadows and dramatic angles of Falcon are descended from the style worked out by Whale and Edeson when they adapted German expressionist techniques to Hollywood horror. Edeson went on to shoot other notable thrillers of the ‘40s, including most of the Peter Lorre-Sidney Greenstreet collaborations and the John Garfield noir Nobody Lives Forever (1946). Edeson won his second Oscar for Casablanca (1942); earlier career highlights include the Best-Picture Oscar winner Mutiny on the Bounty (1935) and nominee Sergeant York (1941). Mescalls résumé is nearly as long, if not quite as distinguished. Before photographing Bride, Mescall had a lengthy career in silents and early sound films, and shot one other horror, The Black Cat (1934). He was DP on four non-horror Whale films, including the fine 1936 version of Showboat. A career sidelight was Youth Runs Wild! (1944), a tepid juvenile delinquency drama produced by Val Lewton, better known for his literate 1940s horror films. Mescall retired shortly after filming Not of This Earth (1957) for Roger Corman, an experience which might drive anyone into retirement. The spirit of Forrest J Ackerman, the genie of this website, looms large over the critics and historians who flesh out the supplements on these Universal horror disks. Their main concerns are pretty much the concerns of his Famous Monsters of Filmland magazine over the decades: biographies of key actors and directors, peeks “behind the scenes,” and the “careers” of monstrous characters in literature, films, sequels and remakes. They have little patience for the business end of Hollywood and the less flashy technical aspects of moviemaking, but endless interest in makeup, special effects and unrealized casting choices. This is the stuff of which fandom is made, and its valuable. But it does make for distracting feature commentaries. Eventually, you either tune out the historians drone and watch the action, or turn away from the screen and listen to the commentary. You get a lot of information about James Whale from these DVDs, but you dont get much insight into the reasons why his movies are so revered. These critics rarely address what I think are the films greatest strengths. If youre an insatiable movie consumer like me, the more movies from the 1930s you see, the more you realize that Whales horrors stood apart, even from other fright films, and not only because of his much-praised ironic wit. In his first genre effort, Frankenstein, Whale and his collaborators famously drew from the style of silent horror films as established by the Germans and adapted by Tod Browning, but then took a giant step beyond. 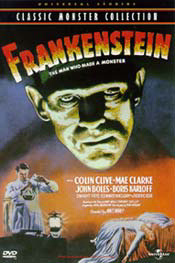 Unlike Brownings dreamlike Dracula (1931) or most of its silent ancestors, Frankenstein takes place in a recognizable if not realistic social and geographical context. Dracula is static and strange, a curio from a dank basement that we hold at arms length; Frankenstein is energized and involving, a modern movie with characters and a point of view. Whale built on those beginnings in Invisible Man, with its carefully drawn picture of a British village and its quirky citizens, and in Bride, with its large cast of well-drawn eccentrics and its ambitious balance of humor, pathos and grotesquery. 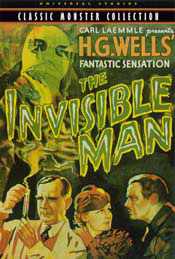 Too many horror movies of the 1930s were dependent on tedious “whodunit” plots, in which the audience waits impatiently for some knuckleheads on the screen to “discover” the monster or mesmerist, but Whales are more akin to classical comedies or tragedies, in which the audience and characters have fate in plain view but are compelled to follow their paths through to the end. As a storyteller, he had an instinct for plot and pace, always started in the midst of the action, and peppered his yarns with odd or exciting moments; nearly every scene contains or describes some conflict. Consider the controversy over Welless Citizen Kane, a work some critics panned as self-indulgent for its self-consciousness. In a classic Kane review published in The New Republic in 1941, Otis Ferguson summarized the standard position of highbrow critics: “The real art of movies concentrates on getting the right story and the right actors, the right kind of production and then smoothing everything out.” Whales best films, like Welless masterpiece, were anything but smooth. But then they were horror films, and not to be taken as seriously as high-minded literary adaptations, according to the most respected critics and most filmmakers of the day, including Whale. Whale did not take his horror subjects too seriously, and his horror films are better for itmore lively, more layered, and more enduringly entertainingan irony that might be appreciated by Whale himself, Hollywoods dark prince of irony.